It's 23:01 in Neunkirchen/Nahe, Germany right now. Town View Neunkirchen/Nahe is a part of Nohfelden at the Bostalsee. Nohfelden-Bosen: Bostalsee, 1.6 miles away. 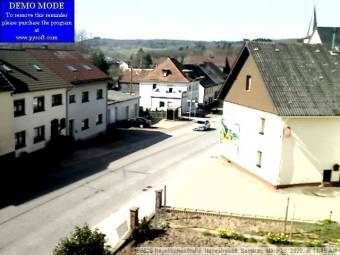 Tholey: Schaumberg Weathercam, 4.7 miles away. Sankt Wendel: Two Webcams, 7.5 miles away. Idar-Oberstein: View of Oberstein, 16.5 miles away. Püttlingen: Köllerbach-Herchenbach, 19.8 miles away. Leiwen: View onto Leiwen, 20.4 miles away. Mettlach: Saar Loop at Mettlach, 21.7 miles away.